Roborace, the autonomous racing series that has hitched its wagon to Formula E, unveiled the (spec) challenger that will be available to teams for the 2016-17 season today — and it’s suitably bonkers. It looks like something the designers at Hot Wheels would dream up for a fantasy car. That actually might not be that crazy considering the designer, Daniel Simon, was responsible for the light cycles in Tron: Legacy [thanks The Verge]. 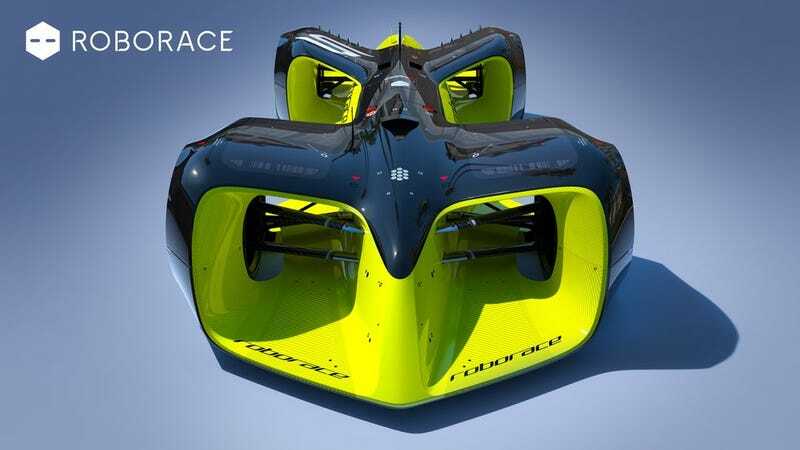 There still isn’t a lot of information available on Roborace and what it’ll consist of aside from this beautiful, autonomous contraption. According to The Verge, this is the car as it will race. Engineers have already had their way with it. Roborace says its car will be capable of 186 mph, but will teams be willing to push the limits of a still relatively unproven technology? Will the autonomous programming (and even the downforce levels) allow the cars to take risks and complete overtakes, or will it settle into a series of boring parade laps *cough*F1*cough*? Autonomous tech doesn’t really interest me — I need my freedoms, damn it! Murica! — but will the actual racing make the series worth watching?